AN EARLY INTERSTATE PROPOSAL: In the 1930's, the existing NJ 23 - known locally as Newark-Pompton Turnpike - was built as a four-lane undivided arterial to connect to US 46. The postwar influx of suburban development, and later, the construction of I-80 through the area, overwhelmed the road. Subsequently, accidents along the four-lane arterial increased. In its 1955 "Yellow Book," the Federal Bureau of Public Roads (BPR) proposed an Interstate highway link from the proposed I-80 in Wayne to I-287 in Pompton Plains. The eight-mile-long route was to be routed along the present day NJ 23, and was to link to the southeast to NJ 3 (also planned as a preliminary Interstate route). By the time the New Jersey State Highway Department finalized plans for its Interstate highway network one year later, the NJ 23 Freeway link had been dropped from the Interstate system. ARTERIAL IN POMPTON PLAINS: Continuing north for six miles from Alps Road north to I-287, the NJDOT decided not to construct a freeway along this section. Instead, it was to widen the existing four-lane arterial to six lanes, add a median barrier and build jughandles for left turns. (Approximately 2.0 miles of this section is multiplexed with US 202.) To the north, this section connects to another arterial section that was reconstructed in the 1970's. Right-of-way acquisition began in 1982, with construction following one year later. The NJDOT completed the short NJ 23 Freeway link (and the arterial upgrade north of the freeway) in 1986. According to the NJDOT, this section of NJ 23 now carries approximately 70,000 vehicles per day (AADT). WAYNE TO PORT JERVIS: In the early 1960's, both the New Jersey State Highway Department and the Tri-State Transportation Commission proposed a 47-mile-long freeway to connect I-80 (at EXIT 53) in Wayne, Passaic County with I-84 in Port Jervis, New York, at the junction of the New York, New Jersey and Pennsylvania borders. Along its southern stretches, the NJ 23 Freeway was to relieve congestion. Further north, the freeway was to provide improved access to the recreational areas in northwest New Jersey and beyond. The existing land service road between Wayne and the New York-New Jersey border at Port Jervis has sub-standard horizontal curvature and very poor grades. These engineering features, coupled with residential and commercial development along the right-of-way, make it impractical to improve the existing roadway. Therefore, it is proposed to build a freeway parallel to the existing NJ 23. The NJ 23 Freeway will fill a large gap in the regional highway grid. It will serve large areas of potential development in Passaic and Sussex counties. The proposed four-to-six lane, 47-mile-long freeway was estimated to cost $120 million. It was proposed as a Federal-aid project, with the Federal and state governments evenly dividing the cost of the freeway. By the early 1970's, concerns about rising construction costs and potential environmental damage killed the NJ 23 Freeway project. In the early 1980's, the NJDOT discussed briefly the possibility of constructing a section of the NJ 23 Freeway to bypass the Franklin-Hamburg area. The new freeway was to be constructed to the east of the existing alignment. However, after strong opposition from merchants along the existing two-lane route, the NJDOT said that it would be a long time before such a plan would be reconsidered. The NJ 23 Freeway Extension, a north-south route through Middlesex, Somerset, Union, Essex and Passaic counties, will fill a major gap in the highway grid with a route through the area between the Garden State Parkway and I-287. It will serve traffic perpendicular to radial routes, relieve congested arterials, provide a truck alternate to the Garden State Parkway, and tie together fast growing suburbs. In 1969, the NJDOT added the NJ 23 Freeway Extension proposal, but it was shown on planning maps as "Route 807." This southerly route, which would have gone through more developed areas, was estimated by the NJDOT to cost $300 million. It was also dead by the early 1970's. The NJDOT should reconsider long-range plans for extending the NJ 23 Freeway from I-80 in Wayne north to I-84 in Port Jervis. Currently, there is enough volume to justify its construction - ideally, as a six-lane facility - from Wayne north to Stockholm. Initially, freeway construction efforts should be focused on this 22-mile stretch of NJ 23. If traffic volume builds on northern stretches of NJ 23, the freeway should be extended north as a four-lane facility to I-84. The NJ 23 Freeway would accommodate the traffic needs of established areas in Passaic County and developing areas in Sussex County. It would also serve as a viable alternate route to I-380 between New York City and Pocono resort areas. 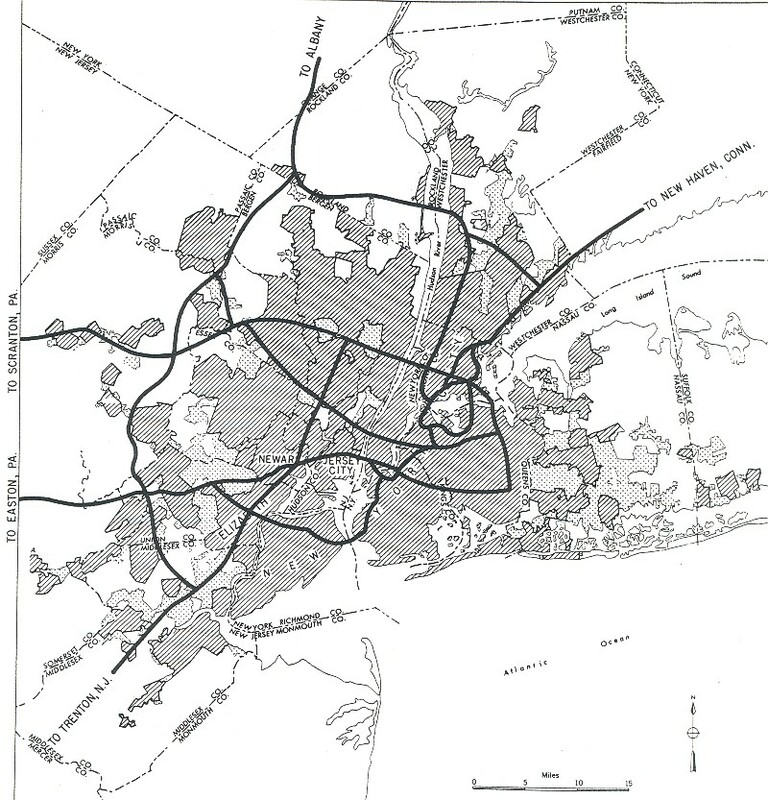 SOURCES: Regional Highways: Status Report, Tri-State Transportation Commission (1962); Transportation 1985: A Regional Plan, Tri-State Transportation Commission (1966); "Improvement of Route 23: Public Hearing," New Jersey Department of Transportation (3/14/1968); New Jersey Highway Facts, New Jersey Department of Transportation (1969); "Interstate 80-84 Links Opposed," The New York Times (11/27/1972); "Route 23: Administrative Action Final Environmental Impact Statement and Section 4(f) Statement," Federal Highway Administration and New Jersey Department of Transportation (1978); Adam Froehlig; George Kowal; Raymond C. Martin; Christopher G. Mason; Dan Moraseski; William F. Yurasko. NJ 23 shield by Ralph Herman. Lightpost by Millerbernd Manufacturing Company. NJ 23 exit and intersection list by Ray Martin.